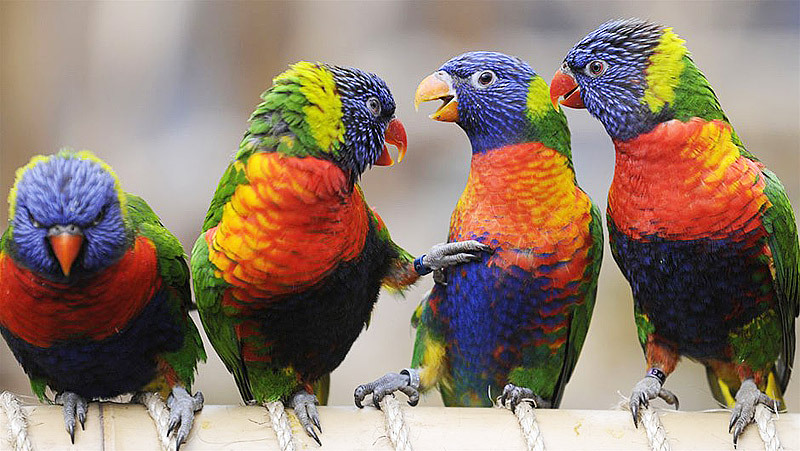 The Lorikeets form a unique group of generally very colorful parrots with several distinctive characteristics. 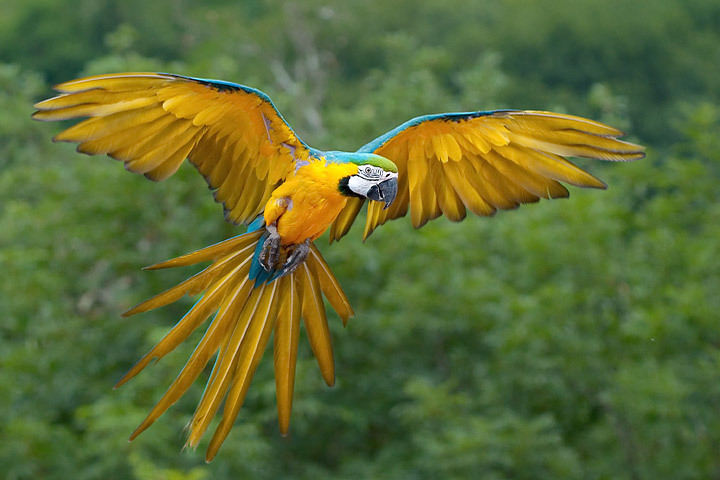 The principal difference from other groups of Parrots is their adaptation to a pollen, nectar and fruit diet. This has led to the development of a brush-like structure at the tip of their tongue, a long, slender bill to assist probing into flowers (and enabling them to give a very painful bite), and the lack of a crop and poorly developed gizzard. These adaptations, together with special digestive enzymes, allow them to effectively utilize their special diet. They are restricted to the western Pacific and the East Indies area, with a total of some 55 species recognized, of which 7 species and subspecies occur in Australia. Many species from Indonesia and adjoining countries are highly endangered due to habitat destruction and collecting for aviculture. All of the Australian species have many avicultural requirements in common, and this introduction will discuss their housing and dietary needs, with any variations being mentioned as each species is covered in the month’s ahead. Because of their special diet, the lorikeets are notorious for the volume and nature of their droppings. If kept in a solid floored aviary then cleaning is a constant and time consuming chore. The advent of suspended aviaries, with mesh floors, has been a minor revolution in their care, and in a breeding setup no other type of aviary can be recommended. Cleaning is a simple matter of hosing down the mesh of the floor. The size of the suspended aviary does not need to be especially large. 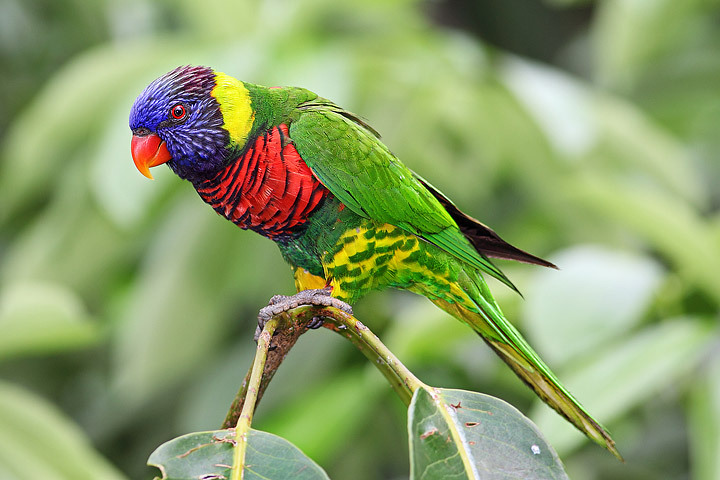 The larger lorikeets such as the Rainbow, Musk and Scaly can be kept in a flight around 2.4 meters (8′) long by 0.6 meters (2′) by 0.9 meters (3′). The smaller species such as the Purple Crowned can be kept in a 1.2 meter (4′) long flight. The usual weather protection is always needed of course. Lorikeets should not be fed seed. Having said that, it has always been my experience that the larger lorikeets, such as the Rainbow and Scaly, readily eat seed if it is available. However if seed is made available (and canary seems to be the most favoured) it should be minor to a diet more suited to their digestive system. 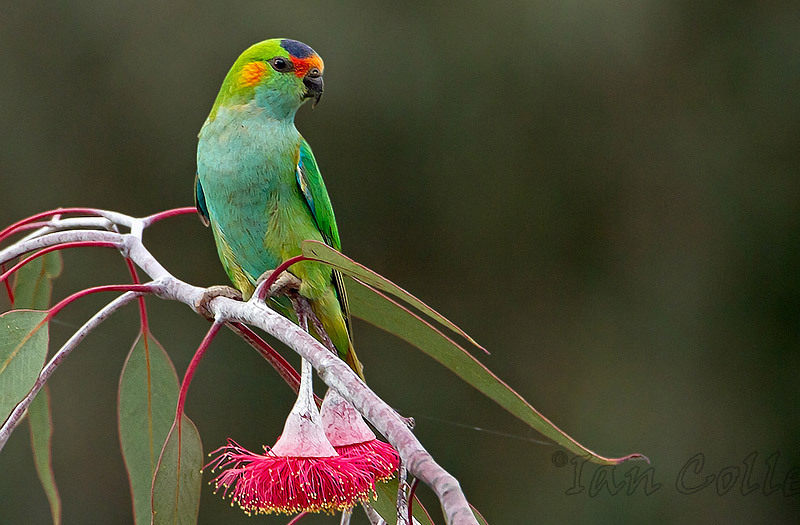 In captivity a nectar and pollen diet is not practical however there are several recipes for lorikeet diets available as well as good commercial mixes. 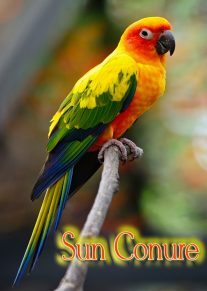 My preference is to have a dry lorikeet mix always available, with a wet nectar mix provided fresh each day, along with plentiful fruit. Apple, pear, grapes, melon, paw paw, mango, oranges and tangerines are all usually enthusiastically eaten. In fact virtually any fruit except avocado can be given. Water, both as drinking and for bathing, is also required. Ingredients mixed together dry and stored in air-tight containers preferably in a fridge. Mix together (it should be a fairly watery mix) and freeze into ice cube trays. give each bird a melted ice cube (about a desert spoon in volume) each day. Any nectar bearing, fresh flowers are always greatly appreciated. 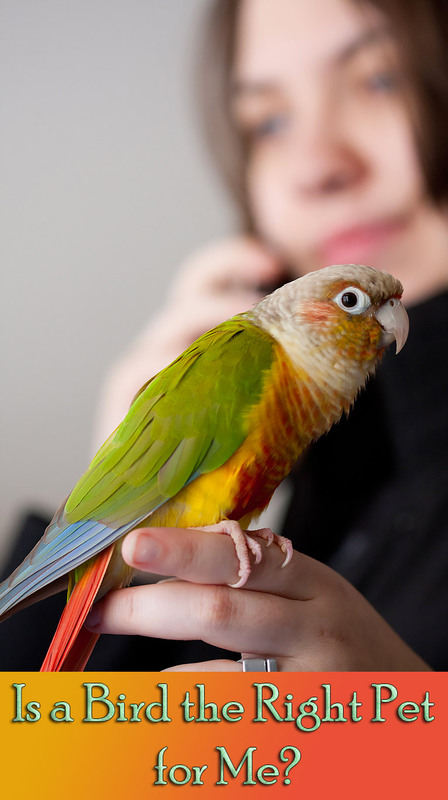 Note that the Rainbow and Red-collared, while recognised as separate by avicultualists, are generally regarded as only races by most ornithologists. 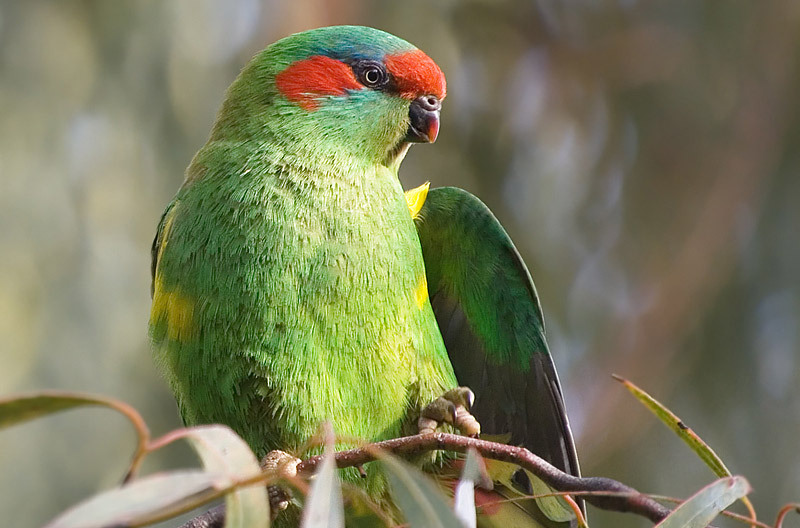 Since they are closely related, they are featured together as the initial Australian Parrot of the Month.